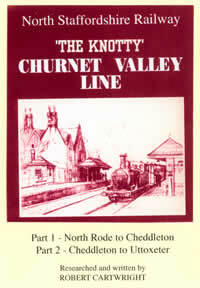 The Churnet Valley Line was built by the North Staffordshire Railway Company and opened in 1849 between North Rode, south of Macclesfield in Cheshire, and Uttoxeter in Staffordshire - a distance of 27.5 miles. Part 1 of the documentary takes a look at the route between North Rode and Cheddleton, south of Leek, and each of the 7 stations serving this section of the line, which ran along the picturesque shoreline of Rudyard Lake. 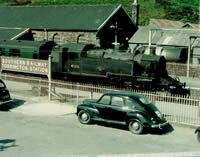 The premier station was Leek, capital of the Staffordshire Moorlands, a textile town and agricultural centre of the district. Part 2 of the documentary follows the section of the route between Cheddleton and Uttoxeter and each of its 7 stations, including Froghall, Oakamoor and Alton, in the heart of the wooded Churnet Valley. 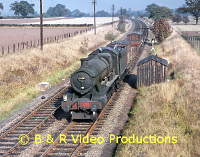 The programme contains unique movie footage which, together with the memories of retired railwaymen, vividly brings to life "steam days" on the North Stafford's most scenic line. The video features the transport by tramway of limestone from the quarries at Cauldon Lowe down to Froghall. and Alton Towers, built by the Earls of Shrewsbury where today's Theme Park draws millions of visitors to its spectacular rides and outstanding gardens. The programme also looks in at Cheddleton Station - home of Churnet Valley Railway, whose aim is to recreate the atmosphere of a country branch line of the 1950s and 1960s. The Route Explored - A documentary in the company of Alan Rimmer, a leading authority on the C & HP, about the now closed line including archive footage and photographs. The Cromford and High Peak Railway, of standard gauge, was opened by 1831 at the dawn of the Railway Age, from Cromford to Whaley Bridge in Derbyshire - a distance of 33 miles. Engineered by Josias Jessop - the line originally employed 9 inclined planes over which wagons were hauled by stationary seam engines. The inclined plane enabled the line to climb from the valleys of the Rivers Derwent and Goyl: to the southern uplands of the Peak District, where the track reached a maximum elevation of 1266 feet above sea level. Hopton Incline, 1in 14 over its steepest section carried the distinction of being the steepest adhesion worked gradient in the British Isles to be regularly worked by steam locomotives. To to avoid engineering works of any magnitude., the line was buiilt with a number of tight curves, the most severe being at Gotham, where the line swung through almost 90 degrees on a radius of 2.5 chains. Taken over by the London and North Western Railway in 1877, the greater part of the northern section of the line from Ladmanlow, near Buxton to Whaley Bridge, closed in 1892. 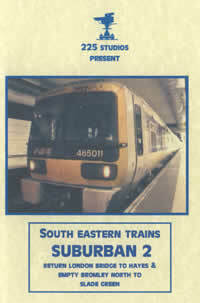 The southern section continued to carry traffic for over 60 years, closing in stages until finally in 1967 the operational life of the High Peak came to an end. In the company of Alan Rimmer, a leading authority on the line, we follow the original alignment from Whaley Bridge to Cromford. 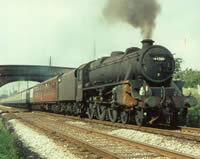 The jouney is enriched by the memories of footplate men, and those having close associations with the line. Plus a chronicle of a 19th Century passenger and archive cine film. 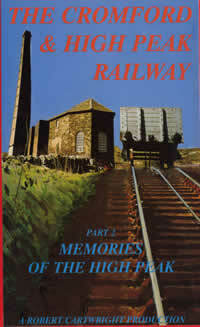 Memories of the High Peak - A programme of memories, supported by stills & movie footage and including the final day of running on 30 April 1967 when huge crowds gathered alongside the notorious Hopton Incline to witness the last ascents by a series of enthusiast specials. 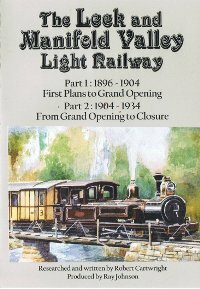 Two videos combined on one DVD: Part 1 - 1896 to 1904, First Plans to Opening and Part 2 - 1904 to 1934, From Grand Opening to Closure. 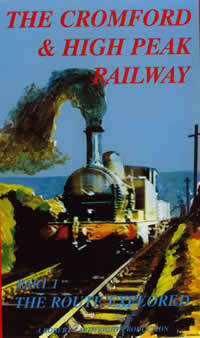 Part1: 1896-1904; First Plans to Grand Opening - Contemporary documents, official plans & newspaper reports are combined with photographs, commissioned illustrations & a detailed & informative commentary to recreate the excitement & controversy raised by the construction of this unique railway which was to bring colonial flavour to the banks of the rivers Hamps & Manifold. Part 2: 1904-1934: From Opening to Closure. The Leek & Manifold Valley Light Railway ran for just over 8 miles from Waterhouse to Hulme End in North Staffordshire from 1904 to 1934. 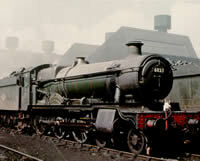 Amalgamation of the railways in 1923 brought the line under control of the London Midland and Scottish Railway. Closed in 1934, the LMS presented the trackbed to Staffordshire County Council who converted it into a path, which opened in 1937. Today's "Manifold Trail" is a very popular walk and cycleway. Movie footage combined with photgraphs, documents and official plans bring to life the turbulent history of this unigue line which in the words of a navvy on Opening Day "starts from nowhere and finishes at the same place!". The Leek & Manifold Valley Light Railway ran for just over 8 miles from Waterhouse to Hulme End in North Staffordshire from 1904 to 1934. The winding trackway of 2'6" gauge with its colonial style locomotives and rolling stock brought the flavour of India to the leafy valleys of the rivers Hamps and Manifold. The line provided an alternative form of transport for the isolated communities of the Staffordshire Moorlands and was popular with excusionists, but freight never reaches the high expectations of its prospectus. 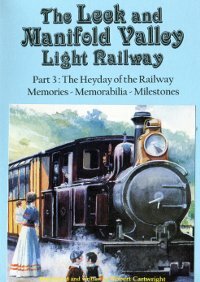 This video through recorded memories, photographs, movie film and memorabilia including contemporary documents, official plans and newspaper reports, together with scale models built by enthusiasts brings to life the colour and the contrasts of this unique line, one of the first to be built in England in the accordance of the Light Railways Act of 1896.